Rarely are two safe moves exactly alike. Some of the more difficult examples include stairways, marble or tile flooring, narrow passages, inclines and non-concrete approaches etc. 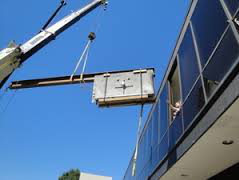 These types of safe moves are not included as standard delivery and may require additional time and costs. An onsite evaluation may be required prior to the move to determine proper placement or removal of the safe and what specialized equipment will be needed to complete the move. We are equipped with Heavy duty Crane trucks, fork lifts, rollers, stackers, etc. to handle just about anything. All quotes for safe moves are basic rates. Use of specialized equipment** may increase the estimate. Basic rates include crane truck, standard safe moving equipment, flat level site access, no stairs and two (2) men. ** Use of specialized equipment (power pallet jack, stackers, stair climbers,) or more difficult sites with stairs is an additional cost. • Number one, that none of your valuable items will be damaged during the move. • Number two, for the safety of our movers, and our equipment, we need to have the safe emptied so that there will be nothing inside shifting around while we are in the process of moving it. Safes are heavy enough empty. If there are items inside that could shift while we are moving it, this could cause a number of safety issues, all of which could be avoided by simply removing your items before we arrive. Reliable Lock and Safe Specialists can remove and dispose of your old or unwanted safes from your home or business. Please call us for a quote today.